Our schools conduct a number of regular emergency drills. Every school conducts a number of fire drills. In addition, schools conduct at least one tornado and one law enforcement (lockdown) drill to practice procedures. ► What’s the difference between a lockout and a lockdown? 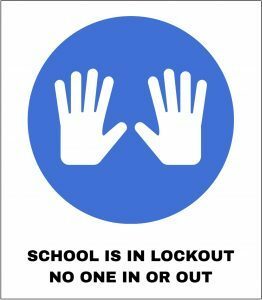 At BPS101, we use the terms “lockout” and “lockdown.” While they may sound similar, the procedures for each are very different. Lockout: A lockout (formerly known as “soft lockdown”) secures the perimeter (doors and windows) of a building to minimize exposure to a safety threat outside, such as criminal activity in the area. During a lockout, no person (parent, student, staff member, guest, etc.) may enter or leave the building and classes will proceed as usual (to the extent possible). A lockout ends when the police department confirms that the threat has passed. In a lockout situation, the school(s) involved will post the sign at right in the front door window to alert visitors of the situation. Lockdown: A lockdown is a physical response to an imminent safety threat inside the building, such as an intruder or attacker. A lockdown response is situational and may include running away, hiding in a secure space, or even fighting the attacker. In a lockdown, staff members and students will evaluate their options to determine safest course of action. In either a lockdown and lockout, schools will act with the safety of students and staff in mind, and school officials will always in coordination with police and fire departments. So that we can keep our focus and effectively manage our emergency resources, we kindly ask that you do not attempt to contact us during a lockout our lockdown. We will always communicate with parents as soon as it is practicable—our first priority is keeping students safe. Keep yourself informed of school procedures by attending parent meetings, reading the student handbook, school newsletters, and checking the school website periodically. Ask your child about their school’s emergency drills, and make sure that your family is prepared for emergencies, too. In addition, be aware of the district-wide Safety Help Line and when to use it. Please do not attempt to call the school during an emergency, we will contact you with the information you need to know. Although there are people assigned to answer phones at school, these lines are likely to be overloaded during an emergency, and are not your best source of information. Keep your phone with you during emergencies so that you can receive updates. ► For school emergency information, check the following sources: the District website, BPS101.net, District Twitter feed @BPS101, and District Facebook feed /BPS101.